I’ve decided that I want to make my design posts more about graphics and less about words. I’m still tweaking how I want the boards to be set up, and I’m sure they’ll be different for each post, so bear with me! Catherine has an amazing sense of style, and she was an absolute pleasure to work with. Don’t forget to go say hi! 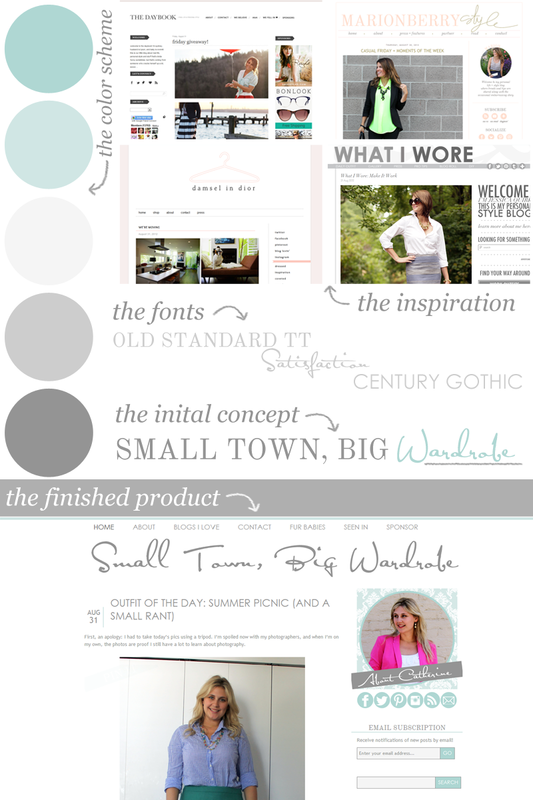 This is a beautiful blog design – love it! Also, how gorgeous is that Satisfaction font? Love it! Thank you so much for all your help – I’m so excited and totally obsessed with my new design! Nice job! It looks great! I think it’s a great way to break down the design process – plus later on when you look back you’ll be able to see how much you’ve grown as a designer. I love this new design – and I love that you added in the inspiration feature. I might borrow it for my next design reveal. Please? Go for it! She picked some really great blogs that you could see the connection to in the final product, so I probably won’t be doing this for all of them :) But that’s what keeps the job interesting- every design process is different! Your design work is fabulous! I love how you laid out this post. Can’t wait to see more like it. The blog design is so cute. It really attract my eyes and honestly speaking I spent my 20-30 minutes on this blog. The most important thing I liked a lot is the header font family that make it more wonderful.